Many different chapters of Romance Writers of America offer contests. There are contests for published and non-published authors. There are contests for the best book cover, the best first chapter, the best hook, and the best meet-cute. And of course there are contests for the best story in a certain category of romance, like historical or paranormal, or in my case, contemporary. Contests are a great way for an RWA chapter to earn money to pay speakers’ fees, the rent on their meeting places, and scholarships for members with financial difficulties. And they are a great chance for authors to gain exposure and recognition. I enter my books in a few contests every year for a few different reasons. Contests are a chance to reach new readers in a very author-saturated market. In a contest, it is guaranteed that a few different people (contest judges) are going to read my book. Maybe one of those people will like my writing style and become someone who enjoys all of my stories. In some contests, the judges are booksellers and librarians. And I definitely want those people to be aware of my stories! As a Harlequin author whose books aren’t available in brick-and-mortar stores, a bookseller can’t help me too much— at least not at this point in my career. But a librarian is a wonderful ally to have, as they may recommend my book to a reader looking for a new romance to try. I actually donate copies of my books to local libraries and libraries in the areas where my books are set, to try to reach out to those readers. That’s how important librarians are! And of course, contests are wonderful because there’s that excitement if I actually place. Even if it’s a smaller contest, it’s a wonderful feeling to realize that multiple readers enjoyed my story enough to rank it among the top entries. And as a fairly new writer, it helps me see how I’m doing. If my book can be a finalist alongside books by authors who I really admire, than it helps me feel like I’m on the right track with my stories. The downside is, there’s that sinking disappointment when I don’t place in a contest. (Which, quite honestly, happens a fair amount!) But I try to use that loss as a learning experience. I often purchase books that placed in my category of that contest, especially if they seem somewhat similar to mine. Then I read and analyze those stories, trying to figure out what made them so appealing. Sometimes I can’t put my finger on what made that book place over mine, but other times I learn something that can help me improve my own writing. In the past my books have been finalists in the National Readers Choice Award and The Golden Quill. I am proud of both of these contests because I really love the authors whose books were judged alongside mine. 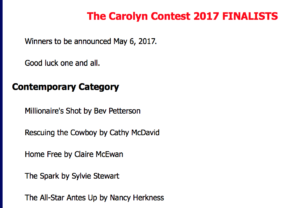 This week I discovered that my November 2016 book, Home Free, is a finalist for the Carolyn Readers Choice Award sponsored by the North Texas chapter of RWA. 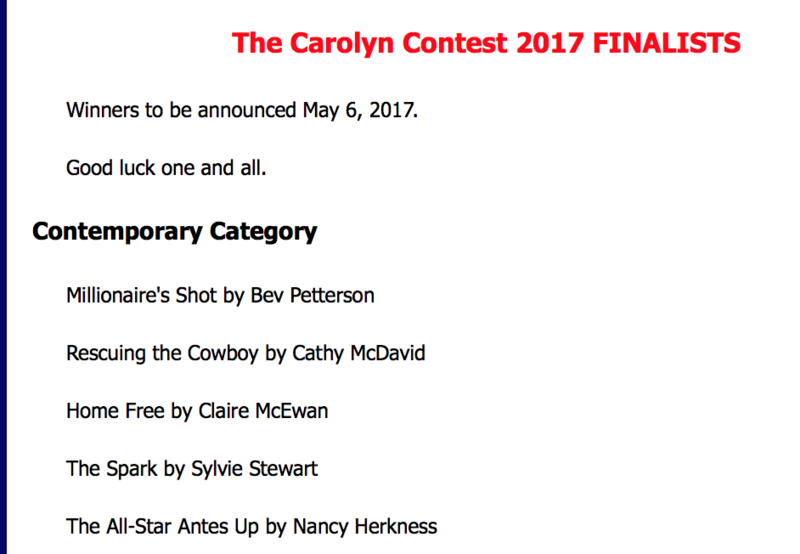 I was happy to get the news, and even more thrilled when I saw my name alongside other finalists like Nancy Herkness and Cathy McDavid, both far more experienced and successful authors than I am! And of course, I immediately went to Amazon and bought Cathy’s book, because it’s western romance and you all know how I feel about that! So please keep your fingers crossed for me, and for Home Free, for this contest and a few others that I’ve entered but haven’t heard from yet. I’m so grateful for the times I’ve been a finalist, but one of these days I’d sure love to be a winner!